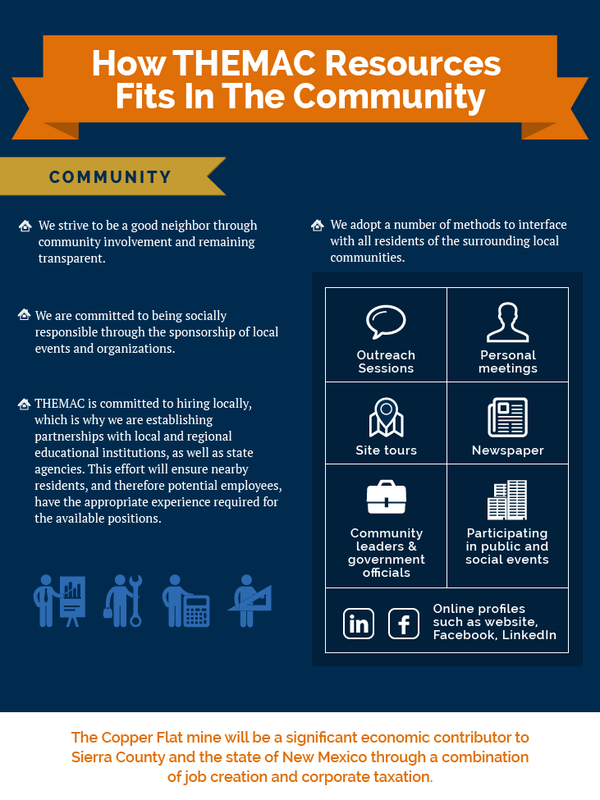 THEMAC is committed to being a good neighbor. Community outreach and involvement is of utmost importance to us, that is why we encourage community members to contact us with questions or concerns. We have a long standing relationship with members of the Sierra County community; we maintain a high degree of transparency. Please refer to the Socioeconomic Study Report generated and compiled by The Arrowhead Center of New Mexico State University. Quarterly and/or semi-annual Outreach Sessions are held with the community members of Truth or Consequence, Elephant Butte, Hillsboro, and Williamsburg. The sessions are meant to update members on activities taking place at Copper Flat involving Permitting, Feasibility, Exploration, Water, and any topics deemed important and of specific inquiry. Residents are encouraged to attend and members of the press are also welcome to be present. In addition to our Outreach Sessions, the Copper Flat Team are keen on personally interfacing with members of the community such as community leaders, social clubs/organizations, educational institutions, and government officials. Tours of the Copper Flat Mine are frequently offered to organizations & groups interested in learning more about Copper Flat. There is a lot to discover and see in person, which is why we are happy to offer site tours to those who are interested in learning more about the history & geology of Copper Flat first-hand.